At the beginning of my journey, as I stared down the road I was about to embark on, there were some issues that I often thought about and made me nervous. Obviously there was anxiety about whether or not I would succeed and there was anger and frustration about the situation I had created for myself but I’m not talking about any of that. The issues I struggled with were the idea of changing my identity. Did I want to be fat? No, but that is the only thing I knew how to be. I didn’t know how to be anything else. There are only a few memories from when I was a small child where I remember not being overweight. I grew up overweight and in a way my fat was part of my identity. I was “big Mike” to most and in almost every circle of friends I was token fat & funny guy. I was comfortable with that role because it’s what I knew. I didn’t know how to be anything else. Although I often hated not being able to break the persona, it is one I knew how to navigate. Losing the weight forever meant finding out who I was all over again. Comfort is about safety. It requires limited to no change or growth. While it is important to have places and times where we can feel safe and know there is a constant, it is also important to push our boundaries and break new ground of we are ever going to progress. Comfort was something I had to give up as I decided to head down this road to become fit. I had to change a lot. My relationship with food, exercise, activities were all subject to change. At the beginning it felt very naked to open myself up to the possibility of total transformation. I found my comfort in the support I received. My constants were God & my wife. There is also something to be said about friends you make as a fat person. I worried about how I would be received into groups. What was my role if I wasn’t the fat & funny guy? While I may not have fit into some social circles in the past (no pun intended), the friends I made were friends who looked past my obvious flaws and loved me. I worried about how the types of people who wanted to associate with me would change. I didn’t want the people who avoided talking to me as a fat person to all of a sudden become buddy-buddy. When you are easy to love, sometimes it’s hard to tell who really loves you. I worried that my relationships would become more superficial and lose depth. Leaving the comfort of my couch and my life, although scary, was exciting and empowering. I decided I was no longer going to let my past define my future. I stopped looking at the changes as loss of identity and began looking at it as gaining my true identity. I recently said, “We are not the sum of our past failures and successes.” What I mean by that is we are just rough drafts, revisions of the person we know we can become. I see that know. It took almost 30 years of my life to realize the potential that was in me. My Dad would always tell me about the incredible potential I possessed and I would roll my eyes and suffer through the speech. Dad, I think I get it now. Now that I have a little more perspective, I see that my worries and fears were unfounded. The only thing I have lost through this journey is pounds, regret, depression and anger. For most who struggle with morbid obesity, the greatest obstacle is not medical related or lack of education. The greatest obstacle to your success is you. Success is sometimes as simple as getting out of your own way. 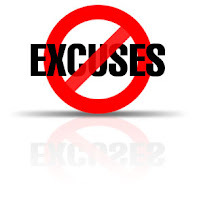 Write down every reason, every excuse why you won't start today. Give em' a score of 1-5. 1 being stupid and 5 being valid. Cross off everything that is 1-3 and figure out the 4-5s. "What was my role if I wasn’t the fat & funny guy?" This is something I've struggled with a lot on my weight loss journey - redefining myself and my identity. I've always been the BIG sister, the BIG friend, the BIG teacher - a good person, but always the big one. Extra jolly and always joking around to draw attention away from The Body. So who am I if I'm not the big one anymore? I've only known myself as obese for the majority of my life - now, who am I? How do I cope with not being that way anymore? The best thing about a weight loss journey is that it doesn't happen overnight. As much as we'd like results right away, we need the time to learn about ourselves and work through this mental/emotional stuff while the physical things get sorted out too! Great post Mike. I don't even know what being fit or normal feels like, I've always been the biggest girl in the room. I seem to find many reasons why I am not exercising or eating right. I will try your exercise tomorrow and see how many excuses I can eliminate. I know that's what they are...just excuses. Good read. I appreciate the candor. I am also the fat and funny (well at least I think I am funny) guy. I was always the guy who was friends with girls but didn't date them. I was the one who passed when others wanted to play b-ball or go mountain biking. I am with you man. Good stuff. I'm finally caught up on all your blogs & have to say that you Sir are an inspiration!! To go from wanting 'the surgery' to seeing that if you want it enough it can be done on your own is amazing to me. 141 pound loss in a year & 1/2 is awesome and the fact that you are working on the inner you just as much as the outter is fabulous! I recently restarted eating better in hopes to lose weight once and for all realizing that this time I have to also get that inner me involved. It's a struggle but it's great to know there are inspirations like you out here!! 1.) Never say or think anything to yourself you wouldn't say to someone you love. 2.) Choose who you are afraid of...Are you afraid of what God thinks or what other people think? 3.) Never be defined by anyone that you don't pray to or are comfortable praying with. This gives me some peace..and definition. I'm not afraid of being a changing person. And I don't define myself by my past and I'm not afraid of being part of the present...most of the time---there's always the fear that you've got a booger hanging out your nose, or my dress being tucked into my underpants that makes me a little nervous...but I'm getting better. I didn't expect people to get mad at me or tune me out because of the changes in me. That's been tough. This helped me tremendously. Angel, I agree. I love your self-image rules Steph. I think if we all lived by your 3 rules we would all be much happier and have more confidence in ourselves. Thank you everyone for sharing. I am pretty sure I have the best readers. The comments are always so much more than "Cool post." Thank you for taking the time to write. I get so much out of it.